Motoring fans attending the 5th Annual Summit Racing Equipment Atlanta Motorama at Atlanta Motor Speedway April 28-29 might think they've stumbled upon a secret watercraft straight out of a James Bond film when they encounter the Tupolev 007 watercraft, but what they'll really be seeing is an amphibious Russian military vehicle built in the 1960s to recover Russian cosmonauts downed in Siberia after the completion of their space flights. Built by Russian aeronautical engineer Aleksei Tupolev of the Tupolev aircraft company, the "Tupolev 007" slated to be on display at this year's Atlanta Motorama is the original prototype from 1965 after the Russian military ordered a design small enough to be transported inside an MK6 helicopter but capable of crossing the lakes, swampy tundra and hostile terrain of remote Siberia in any weather. At its original unveiling at the "Exhibition Tupolev," Aleksei's design won the "Diploma of Finest Engineer in the USSR" and several prestigious medals including for the propeller design, the body style and overall appearance. Tupolev's amphibious vehicle design is over 18 feet long, eight feet wide, weighs 4,600 pounds and can hold more than 90 gallons of fuel. Its payload capacity for plucking cosmonauts out of the Siberian wilderness is around 1,100 pounds, and its six-foot propeller powers it forward at up to 100 mph. Though both the exterior and interior have been restored with new paint, leather and carpet flooring, the Tupolev 007 still has its original owner's manual and tool kit first supplied in 1965. But perhaps the most mysterious thing about Aleksei Tupolev's design is that the exact number of these highly versatile and advanced vehicles to be manufactured has always been a closely held secret of the former Soviet Union. 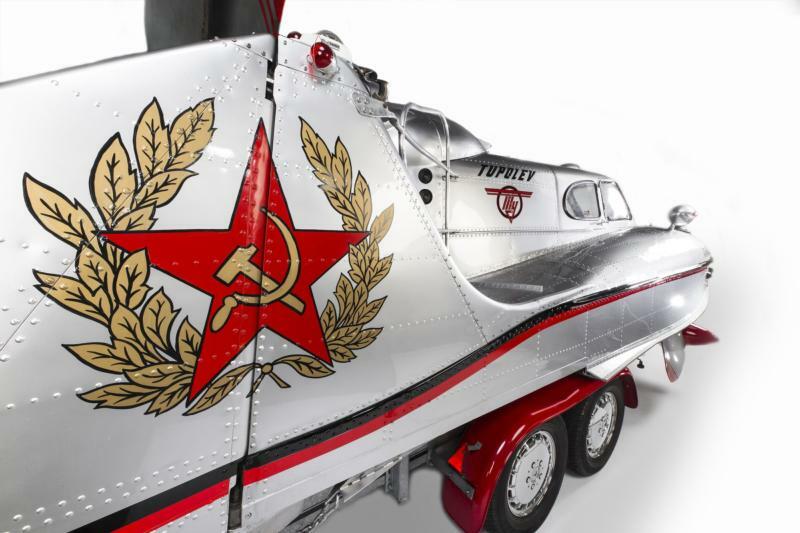 For more information about the Tupolev 007, visit www.russianboat.com. Spectator admission to Summit Racing Equipment Atlanta Motorama is only $12 per day. Kids ages 6 to 11 will be admitted for $5, and kids 5 and under will be admitted for free. Camping at the speedway is available during the event, and full hook-up and dry camping can be reserved for the weekend. For more event information and to purchase tickets, visit www.atlantamotorama.com or contact the Atlanta Motor Speedway ticket office at (770) 946-4211 or (877) 9-AMS-TIX.